Can the banners be replaced/swapped out by the user or does the stand have to be sent back to replace the banner? Yes, you can change the banners yourself in this stand. There are instructions on the website, but sometimes they aren't written very clearly so if you have any problems, feel free to call us and we can talk you through the process. Banner height below 24": Utilizing variable adjustment of the upper pole section and removal of the bottom section of the pole, what is the alternative minimum to maximum height range? 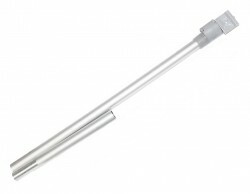 The bottom fixed pole section is a little over 8" long, so if you remove that section, the height range would be 16" to 28". What is the difference between economy, standard, fabric, and premium? Can you provide a detailed explanation of these various styles? When you click each of the option, the description of the material will appear so you can read about each one. We also have printed samples of each so if you'd like to see them in person, you can contact us and we'll be happy to mail you those samples, or just answer any questions you have. Does my artwork have to match the size of your banners, or can you make it fit the width, leaving white space at the bottom? We can scale your art to the correct width and leave any extra space at the bottom white, or fill it with color, if that's what you'd like. Just indicate that in the Special Instructions when you order. What is the weight of the 36" version in total, including the carrying case? The shipping weight is 7 lbs, which can be found in the Specs & Templates tab, so without the box, the weight is about 6 lbs. What is the production time on this item? Normal production time with a banner is 4 business days, and there are 2 and 1 day rush options available as well. During checkout, the delivery date will be shown based on the shipping method you select, so you can change any of those options to see when your order will arrive. There is also a spot to indicate if you have a particular due date, and the system will calculate the least expensive combination of rush service and shipping method to get the order to you by that date. 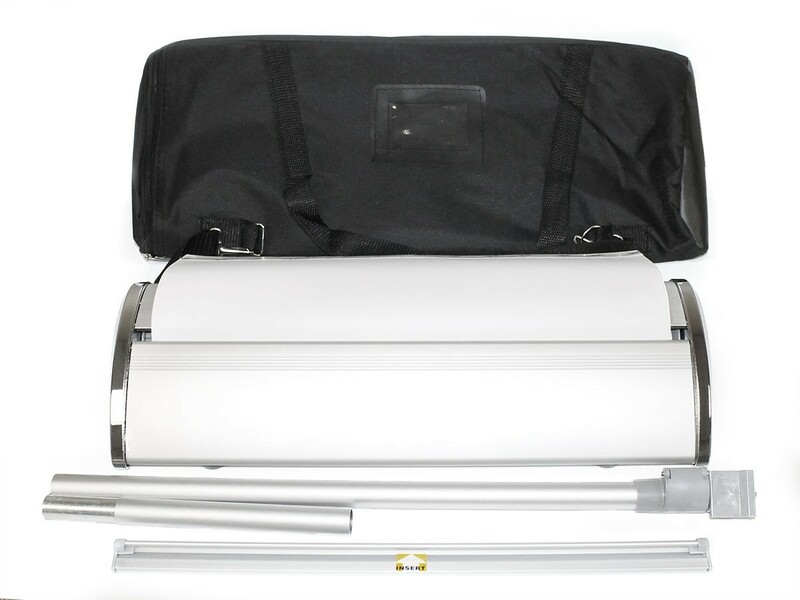 Will you identify one or more carrying cases on your Accessories & Parts page (https://www.bannerstandpros.com), or elsewhere, suitable for an Expo Pro Table Top stand with banner installed? The Expo Pro table top comes with a soft carry bag. If you're looking for a shipping case, there's nothing that's as small as this stand so it would have to be a larger case. The SmartPak Banner Case is the only case we offer that won't hold this stand. Any of the other shipping cases would hold this, but a sturdy box might be more economical unless you have more than just this stand to ship. The Expo Pro Table Top retractable banner stand is our newest table top display. This is a table top size of the popular Expo Pro banner stand, so it has all the same features including adjustable tension, and direct mounting to the roller with a snap rail, but we've also added a leader with adhesive to provide two options for attaching the banner to the roller. 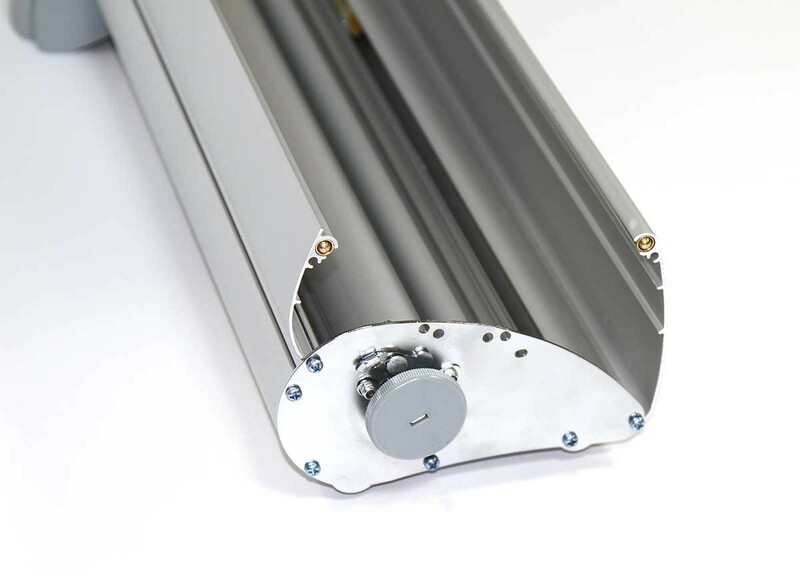 While most customers like the snap rail mounting to the roller because it requires no adhesive or special treatments on the banner, some people prefer a traditional adhesive attachment, so we provided both to allow each customer to use the method they prefer. 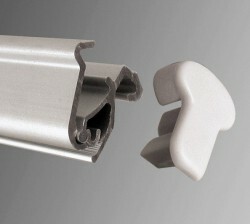 The stand comes with the leader attached to the roller with the snap rail, so it can be used or easily removed while attaching the banner to the roller. Designed as a replacement for the Executive table top banner stand, the Expo Pro table top banner stand takes up less table space, has no loose parts that can get lost, and offers superior quality manufacturing compared to the Executive table top, while selling for the same price. It also has the added features mentioned above, making it an excellent value and our new favorite table top retractable banner stand. For a short time after the Executive Table Top was discontinued, we offered the Metro Table Top banner stand as a replacement. We received a great deal of feedback from customers which led us to develop the Expo Pro Table Top. For any customers who still wish to purchase the Metro Table Top stand, it is still available even though we no longer offer it on our website, so contact us and we can help you with the order. These table top banner stands were created because of our dissatisfaction with the other tabletop retractable banner stands on the market, which are all cheap, promotional products that are intended as disposable, short term displays, or full size banner stands made shorter for use on a table. The Executive table top banner stand was a huge success for us, so we decided to improve the design further for greater reliability so it would appeal to even more customers. The results are our finest quality table top banner stand to date. One of the requested features is for the height range to be a more popular 24"-36", so we made that change. 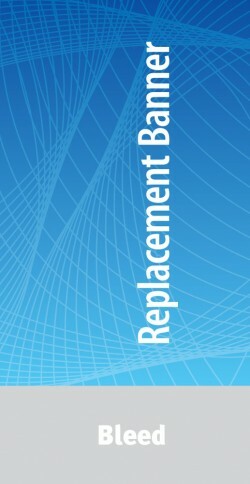 It's also possible to remove the bottom section of the pole to make shorter banner heights, if necessary, so contact us if you need a special banner height that is outside the normal range. Also called tabletop roll up banner stands or pull up banner stands, this style of table top banner display features a spring loaded roller that holds the banner under tension, and rolls it safely into the base for storage between uses. 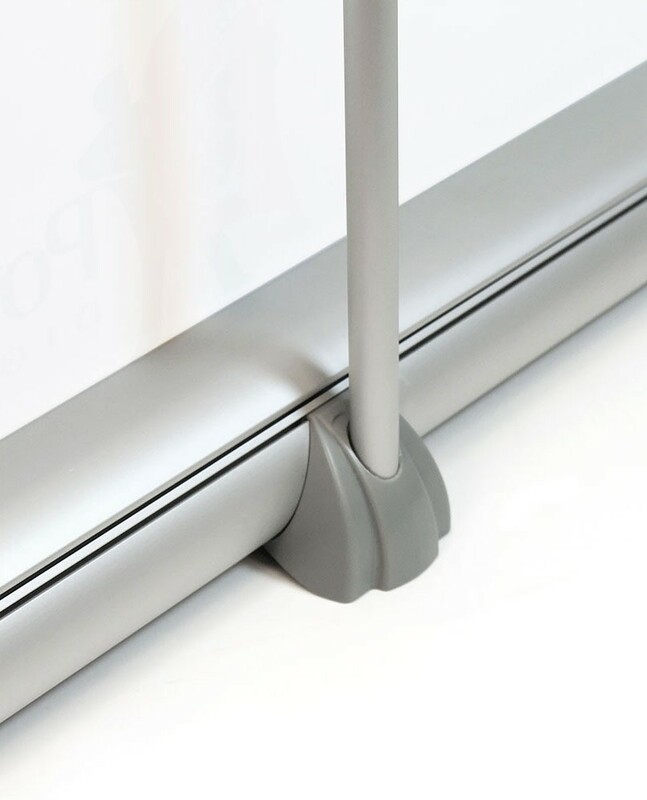 The Expo Pro Table Top uses a snap style top rail to attach to the top of the banner. 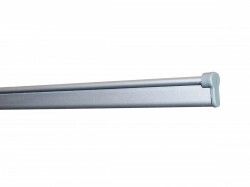 This is the most versatile style of top rail as it will securely hold almost any type of banner material without adhesives or other special treatments. As mentioned above, the bottom attaches to the roller via a snap rail as well, or to a standard plastic leader with double sided adhesive that we've attached to the snap rail at the factory. This allows either method to be used. 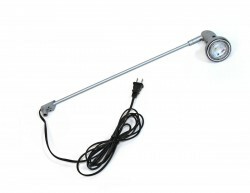 The support pole has two sections connected by bungee, with a lever lock adjustable section on the upper part of the pole. 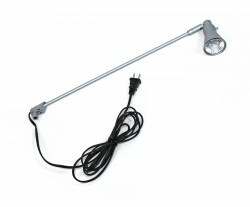 This give the stand a range of heights from 24" to 36" tall. The adjustable tension knob makes it easy to add more tension or completely re-tension the roller, if that should become necessary. The tension can also be completely released when changing banners, rather than having to lock the roller first, for those who prefer to do so. 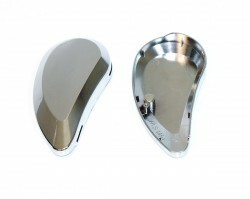 The Expo Pro Table Top comes in anodized silver with removable polished end caps for professional look. It also has adjustable feet that allows the display angle to be fine tuned, and a padded travel bag with shoulder strap is also included. 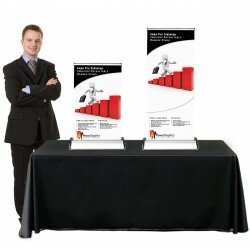 The Expo Pro Table Top displays a banner with a visible size of 15" x 24" to 36". For those who wish to add a light to their table top banner stand, the Silver Light or Silver Light LED are the recommended options. 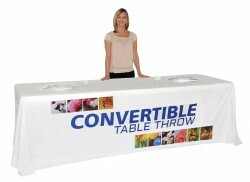 Other complementary products such as table covers and table runners are also available in the Related Products tab. Shipping size: 21" x 7" x 7"